A natural follow-up to Lawson’s cycling waves theory of disease is a nearly identical theory proposed by John W. Tripe around 1874. Dr. Tripe was a practicing meteorologist for more than 20 years by the time he wrote this article. His more important writings pertained to the effects of temperature fluctuations on disease cycles, noting certain diseases tended to strike at certain times of the year due to relationship with the cause. For Scarlatina he addressed that in one of his earliest writings on this topic. Lawson was licensed in medicine and trained in work as a surgeon; Tripe was primarily trained in meteorology first, medicine second. Lawson spent much of his time focused on the magnetic fields of the earth and the underlying physical science theory related to this theory; Tripe pays less attention to the Faraday concepts, thus his readers require little to no understanding of Faraday’s concepts. Lawson tended to move towards a 2 or 3 year cycles pattern for part of his argument; Tripe relied upon a 5 year cycle, which when you review the actual epidemic years appears to be more a 4 to 6 year period. Lawson’s disease focus was yellow fever at first, but became more applicable to the understanding of Asiatic cholera disease patterns; Tripe’s theory related to Scarlatina, a disease with a very different set of environmental and human ecological behaviors, as noted by Farr’s/Aitken’s classifications for each of these two sets of disease types (Lawson’s vs. Tripe’s). One of the things about theories in science is that people within a similar professions sometimes engage in this flocking behavior. Such was the case for Lawson’s philosophy and ideologies. Lawson developed a limited following for his physical/metaphysical-like claims about the cycling of disease patterns and the role that magnetism played upon the health of the individual. Likewise, Tripe’s fame and success suggest his philosophy too had its limited following, but perhaps with not so much resistance as Lawson’s work developed for his. One of Lawson’s most devoted followers, Felkin, was interestingly also a devoted missionary practitioner and a metaphysicist with interests in Masonic philosophy and thinking. Masons were very much devoted to converting the God-centered approach managed by traditional religions and turn these beliefs into self-will, inner power-centered philosophies and practices. Masons were another step away from the traditional religious paradigm than many might place Quakers and Shakers, and perhaps even Christian Scientists and Fillmore-derived Unity followers. Tripe maintained a more level-headed thinking and tradition that prevented him from being classified as too much of an outsider to traditional physical medicine, physical body focused thinking as a healer. The following works by Tripe help to provide yet another facet of this story that is worth exploring. The Sanitary Record, 1879-1880. Vol. 1, new series. Has series of articles by Tripe on waters, and various reports of his work on antisepsis. 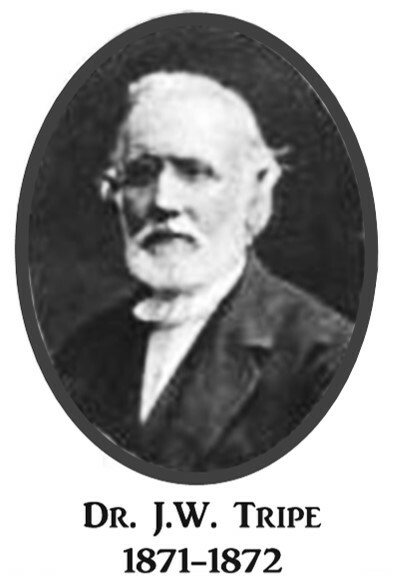 John W. Tripe. Opening Address on Some of the Relations of Meteorological Phenomena to Man, delivered at the Society of Medical Officers of Health, October 20, 1882. Medical Times and Gazette, Nov. 4, 1882. p. 545-550.